T-Mobile exclusively launched a white version of the BlackBerry Pearl today. The Pearl is the first multimedia capable BlackBerry and is being targeted more towards consumers than other BlackBerry models. The device is myFaves compatible and has the option of a $19.99/month unlimited data plan (tack on $10 extra monthly for BlackBerry enterprise email). 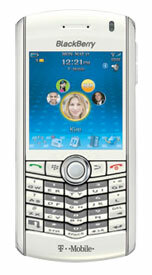 T-Mobile is selling the BlackBerry Pearl White for $149.99 after a 2-year contract and $50 mail-in rebate. The original "piano black" Pearl is also available at the same price. Cingular is carrying the black version for $199 after comparable promotions.